Introducing THE IQ POWER FANTOM! Simco-Ion is proud to introduce the IQ Power Fantom™ Wide-Format Ionizing Blower. This newest addition to the IQ Power family brings the advanced technology of IQ Power to blowers, offering superior ionization performance. Linking with the Control Station provides a remote way of controlling the Fantom’s features. It also provides monitoring and data logging information from the blower to insure peak performance. The Fantom blower has several mounting options. It comes with four threaded mounting holes for custom mounting. The optional tilt bracket is available as an additional part. It allows for mounting on 80/20 and provides a 15-degree position locking knob. 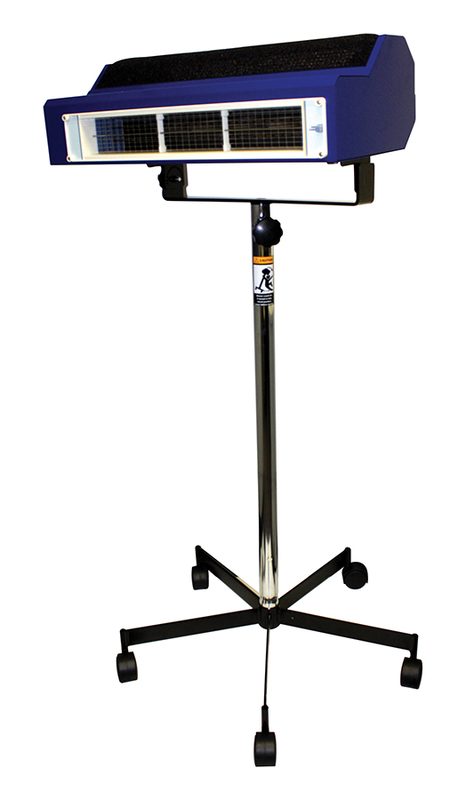 A portable floor stand is also availible. Click this link to find out more about the Fantom! IQ Power Control Station 6.0 is on the Way! The IQ Power Control Station is being upgraded to software 6.0. This update includes some major upgrades to the Panel PC, Relay Board and Anybus board. So what does this mean for you? It means faster speeds of polling, data collection and faster operating speeds for devices. Polling happens 10 times faster than previous versions and fault conditions are reported almost instantaneously. With a focus on continuous improvement, Simco-Ion is dedicated to developing advanced products designed to improve productivity through enhanced system performance and operation. The new 6.0 version of IQ Power Control Station will be available at the beginning of March!